ENCOUNTER re his new book SHIMMERING LIGHT. Investigator of historical occult mysteries, author of pulp fiction novels and a screenwriter who has appeared on History Channel’s ‘Ancient Aliens’. 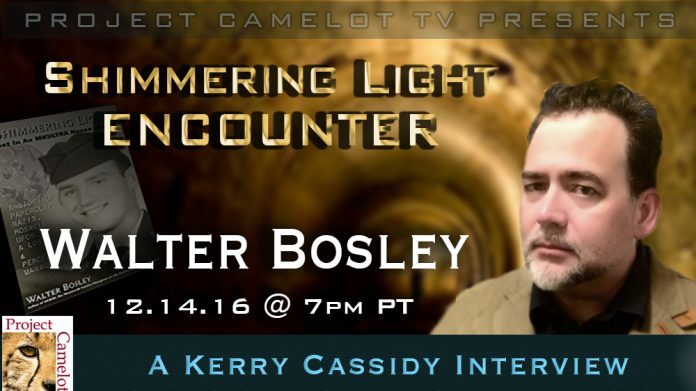 Walter Bosley was born in San Diego, California, and attended SDSU where he earned a B.A. in Journalism. He has been employed by the Federal Bureau of Investigation, is an inactive reserve officer in the US Air Force for which he served as a Special Agent of the AFOSI while on active duty, and then worked as a counterterrorism operational consultant for six years following military service.